It is clear that the US State Department’s senior level officials are awaiting Hillary Clinton’s term in the White House, while sharing her views on foreign policy along with a deep hatred of Russia. The ongoing US struggle against Moscow in a bid to retain control over the flow of hydrocarbons that have always been at the core of the strategy pursued by Washington. It’s clear that officials from the State Department are seeking for a hardliner in the White House, who would make US foreign policy tough and uncompromising after eight years of Obama’s presidency during which the world saw a partial withdrawal of troops from Iraq and Afghanistan, the rejection of the US bombing campaign in Syria in 2014, Washington’s unwillingness to participate in a NATO ground operation in Libya, and the refusal to launch a direct military intervention in Yemen. And now we witness the preparations for drastic change in Washington’s policies that will return to the practice of direct military interventions, countless wars overseas and ongoing meddling in the internal affairs of sovereign states in the name of “US national interests and the protection of democratic values.” A couple of days ago dozens of US State Department officials signed a confidential document, calling for President Obama to launch a military assault against the government in Damascus. In their view, regime change in Syria is the only way to deal with ISIS. According to The Wall Street Journal, a total of 51 high-profile officials put their signatures upon the document in a bid to push President Obama towards military aggression. This so-called recommendation is based on the notion that Syrian authorities have allegedly been violating the ceasefire agreement. According to the authors of the letter, Washington’s inability to stop Assad‘s “outrageous crimes” will strengthen the ideological appeal of ISIS, despite setbacks on the battlefield that the militants have been facing lately. It should be noted that addressing the US president in such letters is a common practice in America, but never before has this number of diplomats put their signatures upon such a document. As pointed out by The New York Times, “51 signatures – is an unprecedented number.” The State Department recognized the fact that this document was drafted, but refused to comment on its contents. It should be noted that a number of days before the letter was drafted and signed, US Secretary of State John Kerry said there’s a threat that the ceasefire may be disrupted in Syria, noting that Washington has run out of patience. He noted that Russia should understand that Washington’s patience is wearing thin and the White House remains convinced that Bashar Assad should be held accountable. 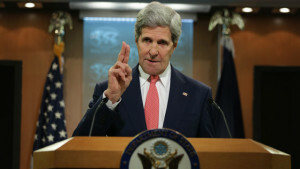 Later, however, after a sharp demarche of the Russian Foreign Minister Sergey Lavrov, the State Department was forced to explain that Kerry did not not try to threaten Moscow and that he simply “expressed his frustration” about the situation. Later on, State Department Spokesperson John Kirby announced that the State Department is not making empty threats and that Kerry’s statement was not an empty threat, because it was not a threat at all. According to Kirby, Kerry just expressed his disappointment of the fact that the Russians are not applying the influence that the US knows it has to achieve the results that Washington desires. Kirby has also claimed, without going into detail, that the US government is actively exploring all available options in Syria. It goes without saying that those option most likely are of a military nature. Earlier, at the end of March, the Secretary Kerry gave an interview to CBS in which he called the notion that Russia has strengthened its position in the Middle East through its operations in Syria absurd. He has also declared that Washington hasn’t allied with Moscow, but at the same time he noted that some steps taken by Russia meet “US strategic interests”. Kerry announced that Russia has helped the US to achieve a nuclear deal with Iran, it has helped the US to remove chemical weapons from Syria, and now it is helping the US to put an end to hostile activities in Syria, which corresponds with Washington’s strategic interests. Around the same time John Kerry visited Moscow to hold talks with Russia’s President Vladimir Putin and Foreign Minister Sergei Lavrov on the situation in Syria. The Secretary of State called the negotiations in Russia “constructive.”, while noting that it’s a common interest of both Russia and the United States to confront terrorists in Syria. However, after Kerry’s visit it was announced that Moscow has no illusions about the possibility of a joint anti-terror alliance Russia could create with the US and other Western countries. It’s clear that Pentagon is waiting for Clinton’s presidency to start. It’s not a coincidence that NATO decided to send four battalions to Poland and the Baltic states, putting them as close to the Russian border as possible. At the same time elements of the US missile defense system are being rapidly deployed in Eastern Europe, while the US increases its military presence in the Baltic and the Black Sea. Anti-Russian operations are being prepared in Central Asia, where a wave of color revolutions are being prepared by the US, with the active use of the anti-Russian slogans. Recent events in Kazakhstan clearly indicate that the Ukrainian scenario may be repeated in Uzbekistan, Kyrgyzstan and Tajikistan, through the use of pro-Western liberal and radical Islamist elements. Some NATO officials are not even trying to pretend that they are not preparing for a posible military conflict with Russia. Along with applying military pressure on Russia, Hillary Clinton will carry on attempts to suffocate Russia’s economy, primarily through the use of Saudi Arabia, Qatar and other oil and gas rich Arab monarchies of the Persian Gulf. Their ongoing campaign of oil price dumping along with Qatar’s LNG supplies to Europe are putting Russia in a difficult position. Naturally, the US will continue developing its shale capabilities to drive the prices even lower. It’s curious that all the attempts that Moscow has made so far to negotiate oil prices with the CSA have yielded no results, nor will they any time in the future. But the Saudis and Qataris are cleverly distracting Russian officials with a string of high-profile visits made by various emissaries promising all varieties of potential deals they have no intention of actually implementing. Saudi Arabia and Qatar are already deeply involved in a hydrocarbon war against Russia. Not by chance, Saudi Deputy Crown Prince Mohammed bin Salman has recently visited Washington to hand over a total of 20% of Hillary’s Presidential campaign funding in exchange for the US dropping all charges against Saudi Arabia for its connections with terrorists. Riyadh and Doha have already put a large bet on Clinton, hoping for a return on their investments from the pillaging of Syria, Iraq, Yemen and Libya. What we’re going to get has been already manifested in the letter by American diplomats to Obama. So Russia has a few months left before Hillary Clinton launches a “new” policy of “old American aggression”.